I have created a project site and added some web part document libraries etc. I would like to use this as a template for all the new sites. 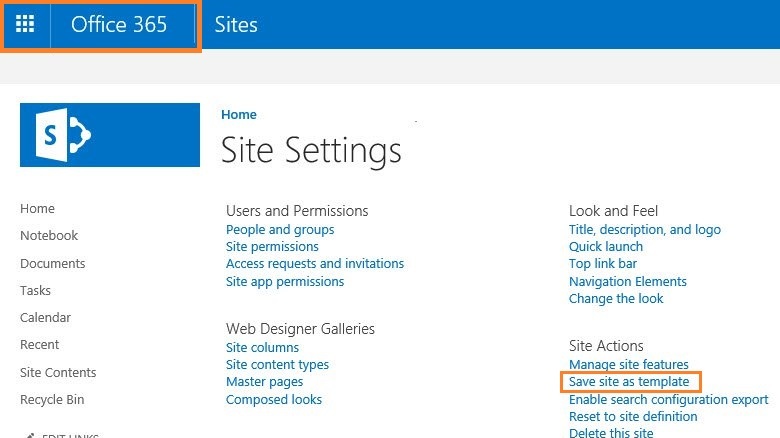 You can use Save site as template option in SharePoint Online to save your current customized site as a template then use this template as a custom template for the future sites. Your Current site is Publishing Site. Your Current site is Community Site. Your Current site is Team Site but the SharePoint Server Publishing feature is currently enabled. Your Current site is Team Site but the Community Site feature is currently enabled. The current site has ever had Publishing or Community Site features enabled can’t be saved as a template. Note: any workaround to savs site as a template for the above cases is not supported and not working properly!! If you disabled Custom Script capabilities in Center Admin, it will lead to missing Save Site As Template option. Create a template of a TFS integrated project site?